Within the works of art in this exhibition is an implicit desire to confront the notion of parental relationships, and stereotypical images of familial behaviour. Bringing the private into the public domain, things which seem perfectly ‘normal’ within the family unit become glaringly odd, distressing, or perverse, outside it. Embedded in the way we see the world are the memories of childhood, and the ways our parents did or didn’t raise us. The exhibition examines the value systems and social conditioning we experience as children, through biographical and autobiographical sources. Wrecking havoc with traditional images of childhood, or clinging to a childhood of sunshine and ice cream, these artists deal with issues of being a child, not only in the sense of being young, but also in that we are all someone’s child, to be dominated, manipulated and loved by those in powerful and controlling positions, our parents. Perhaps this is why we rebel against our parents. Without a distinct generational gap, without change, there can never be an evolution of social agendas. What was good for our parents is not necessarily good for us. And yet while we attack the past, and anticipate the future, there is an implicit desire for the way things were; for a time when things were uncomplicated, and when decisions were easy- when our parents were gods, and the malaise of society was not our concern. When the notion of the happy family is perverted, what do we have left? Crossing the family threshold, boundaries of shame and taboo, we see the grotesque decadence of contemporary society in which the dining table where mother offers up plastic dinners for the nourishment of our body and soul is the longed for norm. We enter a strange world of unspoken secrets and insinuation which is baffling for the uninitiated. What happens behind closed doors, be it happy, sad, or disgusting, is sacrosanct. This exhibition opens up those doors. What we find unsettling in this exhibition may not be because what is presented is shocking or tender, but rather because, when we scratch away at the veneer of happy families, we see reflected a raging truth. We see the multiple layers of our own behaviour. 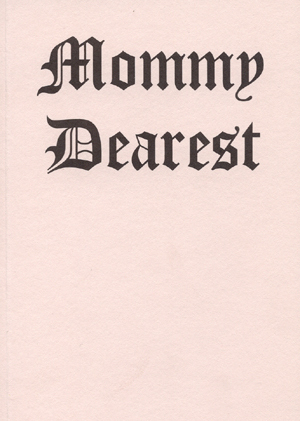 By opening the debate of what is acceptable or appropriate behaviour for mothers, fathers and children, Mommy Dearest makes us confront images which contrast the traumas of sexual perversion and trusting innocence within the family. Reexamining the relationship we have with our families is a course of reinventing ourselves, of discovering where we come from, and ultimately, to make a decision to embrace or reject what we find.